"Man overboard!" There is a good reason for that nautical term, says Suzanne Pogell, founder of Womanship Sailing School. "Statistics show that men typically account for more than 80% of all boaters who fall overboard", she explains. "Safe sailing is the primary issue for women". That lone law sums up the difference between Womanship and other boating schools--especially those run by men. Whether theyre teaching females or males, women have a different way of instruction, says Robin, a 20-year veteran of the school, who pilots a 400-ton tugboat when shes not teaching sailing.Weve found that our female staff somehow makes learning easier for many students." Suzanne founded Womanship in 1984 to provide a unique experience for women. "It was the first sailing school designed by women, for women," she says. I started it for selfish reasons. I just fell in love with sailing. Womanship has taught women ranging in age from 18 to 82. While females make up the bulk of the student body, they also welcome men--under the right conditions. "We held our first couple's course after one wife finished the class and asked if her husband could take it," Suzanne remembers. "She told me, 'I have everything I came for, now I want you to teach him.'" Courses vary in length as much as they do in location. Students can spend two days learning boating basics without leaving sight of the Annapolis waterfront; tour the Chesapeake Bay for seven days; or join two-week ocean cruises in such far off places as Greece, Turkey, Ireland, or New Zealand. In addition to teaching adults, Womanship also offers classes for junior high and high school students. And a few years ago, the school started combining ages with its mother-daughter classes. These three-day courses give participants the chance to practice everything from docking the boat to reading nautical charts. Annapolis resident Nadja Maril and her daughter, 14-year-old Alex, recently came aboard for one of the family-friendly cruises. "I took lessons on a small sailboat many years ago at Club Med," Nadja says. "But this is a much bigger boat. It's a totally different thing." Despite her sailing experience, Nadja was glad to let Robin do the teaching. "As any parent knows, it's sometimes hard to be someone's mother and her teacher," Nadja adds. "But when you start out on equal footing, you learn together. It's a great bonding experience." Jane Skolnick, a native of the Chesapeake Bay area, set sail with her two daughters, 15-year-old Rebecca and 13-year-old Audrey. "I heard about the course from my husband, who's an avid sailor," Jane says. "My daughters have gone to sailing camps for the past couple of years and always enjoyed it. So I wanted to learn how to enjoy it too." Jane agrees with Nadja that women know best on the waves. "I originally thought that the gender wouldn't matter. Now looking back I believe it made a huge difference," she says. "The girls really felt comfortable taking instructions from Robin. And she didn't yell once." 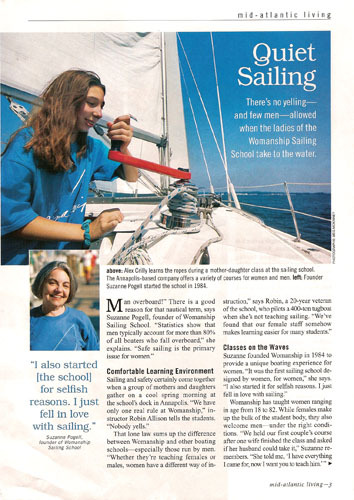 From its base in Maryland, Womanship has grown into one of the country's largest boating schools. The company boasts more than 15 locations, 100 instructors, and as many as 2,000 students participating every year. While sailing-crazed Annapolis serves as its home port, the school also offers classes in the Virgin Islands, Florida Keys, New England, California, Canada, Ireland, Greece, Turkey, and New Zealand. For More Information: Contact Womanship Sailing School for Women, 137 Conduit Street, Annapolis, MD 21401; 800-342-9295 or www.womanship.com. Class fees range from $490 for a two-day course to $3,840 for a 12-day cruise to Greece. Discounts are available for groups of two to six.